Trever was an illustrator, painter, and designer before becoming a part-time pipe maker. 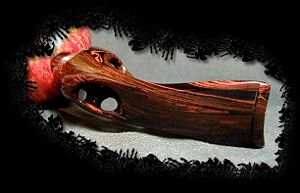 He won the Pipes & Tobacco Pipe Carving contest, which eventually lead to full-time pipe making. Paul Perri was the first mentor, and he has since learned from Al Baier, Mark Tinsky, Mike Butera, Paul Bonaquisti, and many more others than he can begin to name. Trever moved to France with his wife in May of 2002. In an article, called Go West, which originally appeared in the French Pipe Mag, Erwin Van Hove has this to say about Trever Talbert: "Halleluiah! One of the very best American artisans has recently settled on French soil. Trever Talbert has actually taken over Patrice Sebilo’s business, the carver whose name is associated with morta pipes, the fascinating material that is half way between vegetable and mineral. 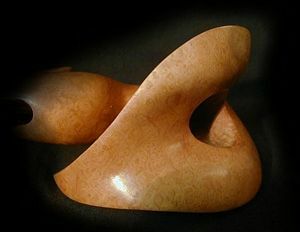 Trever gives free rein to his creativity in shaping elegant and refined mortas. Yet, briar is still his primary material, where something is offered for every taste. The Ligne Bretagne, made out of an old stock of preturned stummels, appeals to collectors of classic shapes, and to those that want to acquire a pipe from a high grade artisan at a very attractive price. 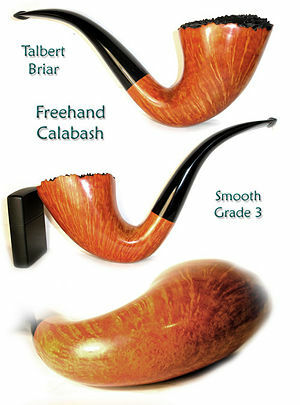 For the aficionados and collectors, Trever presents the Talbert Briar series. 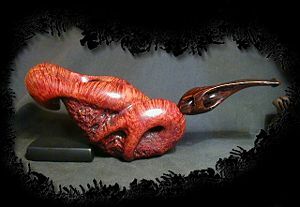 These pipes are superb creations, made entirely by hand, that truly reflect his remarkable talent. Eclectic in style, often very personal in nature, featuring construction and finish of the highest caliber, these masterpieces can satisfy the most blasé of collectors. 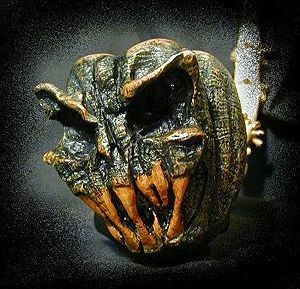 In turn, the most uncommon and therefore the most expensive series, baptized Halloween, really raise some eyebrows. Like the name implies, they are often bizarre creations that look like they came straight out of a Bosch painting or a horror movie. 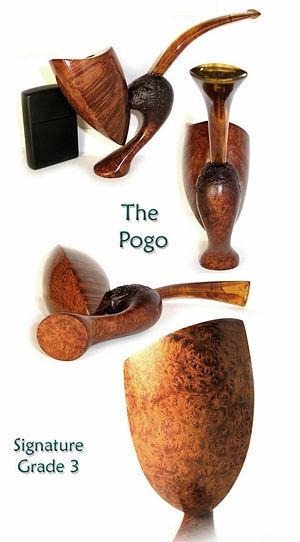 Amazing tours de force, these pieces might be more appealing to the experienced collector than to the mere common pipe smoker. It should also be noted that since Trever set up his new sand blast equipment, he has produced blasts that are simply breathtaking." Thankfully for us in the states, Trever continued to send many pipes back to us through direct sales from his website, and he also sent many of his pipes to the Pipe & Pint. 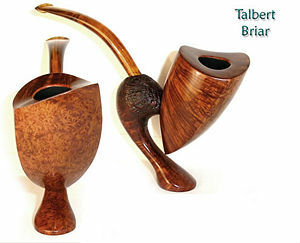 In addition to briar, Trever also makes pipes out of Morta (bog oak, a partially petrified oak). Bog wood is wood extracted from trunks of trees that have been buried in peat bogs and preserved from decay by the acidity and anaerobic bog conditions and the tannins leached out of other plant matter. It represents the first early stages in the fossilization of wood, with further stages ultimately forming lignite and coal over a period of many millions of years. Trever's amazingly creative designs have been an inspiration. His work and very helpfull advice and encouragement have been highly influential on the new generation of high grade American pipe makers. SYSOP NOTE: The following article is now very dated but has some excellent information on the early part of Trever's career. 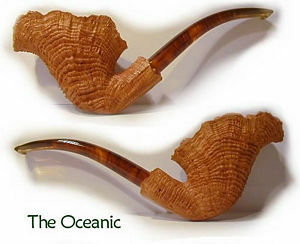 It originally appeared in the Profiles of American Pipes Makers series in a 1998 issue of The Pipe Collector, the official newsletter of the American Society of Pipe Collectors (NASPC), and is used by permission. It's a great organization--consider joining. I was born in 1966, an only child, in the small town of Welcome N.C. (about 4,000 people), where I spent most of my life until college. My mother was artistically inclined, though she had never seriously pursued an active career in art, and she spent a lot of my childhood encouraging me toward creative pursuits. In early grade school, I was actively writing and drawing my own comic books and strips as well as writing stories. I was a bit of a weird kid, no doubt, which occasionally caused troubles, depending on the teacher. My third grade teacher was upset and intimidated by my choice of reading materials (Lord of the Rings, Jaws, and piles of fantasy and horror fiction) and had me hauled off to a child psychologist. He deduced that I wasn't warped at all byt was instead reading on a senior high school/early college level. That describes a lot of my education. Really, usually all I needed was some basic understanding of a field, and I'd trek far and wide to learn everything I could about it on my own. If a subject didn't intereest me, however, no amount of pressure or cajoling could get me to exert more than the minimal effort. I worked vest with teacheers who were happy to give me basic instructions and then encourage me to follow my own parths (with the occasional critique), as opposed to those who insisted on forcing me to do things their way. I've always been a vigorously independent thinker. I went on to make a few more pipes from pre-drilled kits, but, by the third one, I was already frustrated with the limitation of pre-drilling. I wanted to use different angels and volw relationships than the conventional kits allowed for, plys the kits weren't drilled for optimal grain use. I was faced with the fact that I had no source for briar blocks and no knowledge of how to drill them. At that time, there was no Internet, as there is today, and information was much harder to come by. Fortunately, I got lucky. 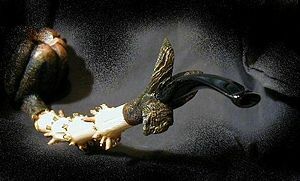 I had founded the pipe smokers forum on AOL, and one of the regulars kew a retired pipe maker named Paul Perri. I contacted Paul, who was living in California at the time, and he turned out to be a very nice fellow. Paul had retired in the late 1970s with a garage full of briar, and I was able to get both wood and knowledge from him. It was a challenge at first, though, as Paul was reluctant to waste time with me. I did my best to convince him that I was good with my hands, and, after he saw the first photos of my pipes, he became more open. I'd never heard of Paul before, but during our association, I gradually came to know that he was the third in a three-generation tier of family pipe makers and had both taught pipe making and imported briar during his life. Paul had a great knowledge of briar and the techniques of pipe making (some of which flew in the face of popular ideas promoted by tobacconists), and I learned everything I could from him. I would send him long letters filled with questions and get page after page of replies written in a squiggly hand and covered with arcane drawings. A lot of the information he sent me was incomprehensible at first, but, as I worked, I gradually began to see how his instructions fit together. Paul was a perfect teacher for me. He would give me all the basics, answer my questions as I hit roadblocks, and otherwise remain neutral. While he held varied opinions about curing techniques, drilling, and staining, he did not attempt to push these on me as gospel (and, as a result, I gave them much more respect than I would have otherwise). Over he next couple of years, I continued to learn and experiment. I slowly bought my tools and became proficient in the basic skills of drilling and cutting. I reached a plateau faily quickly, for pipe making is reallly not particularly complex, especially compared with painting or programming. At this point, in late 1996/early 1997, I began to take stock of things and started looking at ways to improve my work. My self-analysis was two-pronged. I looked hard at designs and shapes, with the intention of meshing the unusual styles that I liked with the practical designs that smoked well. I also began to think about the underlying engineering of the pipe, and that was where I started to apply my knowledge of airflow in duct systems. 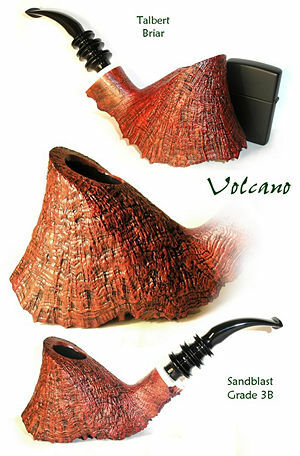 I began to use techniques adapted from this science to improve the follow in my pipes, and I discovered that, with some simple modifications, a good-smoking pipe could become exceptional. I vigorously attacked the causes of wet smoking and began to rethink my shapes and designs based on my new fundamental rules. Ironically, I have since discovered that the techniques I came up with are staples of ultra-high-grade makers such as S. Bang and Lars Ivarsson. I have no idea how they arrived at their results, but it was gratifying to know that the odd tricks I had formulated were already accepted in pipedom's elite landscape. I decided to strike while the iron was hot, so to speak, and put together a set of scans of the pipes I had already made. To my great astonishment, they all sold in three days. A that point, I realized I needed a better method of selling my pipes and decided to look into using the web for marketing. I had tried selling through a local shop with no success, but I suspect that my wild designs and the shop's conservative clientèle didn't mesh well. Over the next month, I intensively studied everything I could about the web and how to run a site, and I set up and posted my own page. The results were again surprising, as I received a lot of positive feedback, and my first catalog of pipes sold out in a short time. So many people had written me to ask for notice when pipes were available that I began keeping a simple mailing list and giving advance notice to everyone on it. 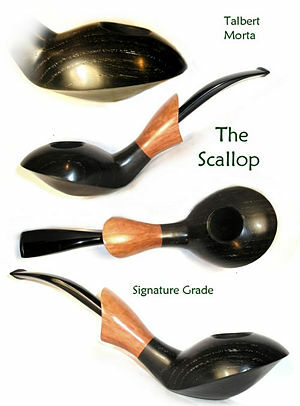 In that way, my pipes tended to be sold out before I ever even posted them publicly. The commercial success of that state was gratifying. I've always made unusual pipes and had honestly never expected them to be received so well. More importantly for me, though, was that they were being smoked and were generating good reviews. The design quality of the first generation of pipes was mixed, with some excellent and other middling, but I always took pains to point out which pipes had design compromises and, as yet, I really haven't had a bad review, though I'm sure I'll make some stinkers sooner or later. My pipes also proved to have international appeal, and I've sold several abroad, even as far away as Taiwan. At this point, I do almost all of my business on the net and have no pipes in shops (although I do sell direct from my home for those within visiting distance). 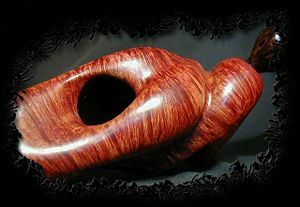 I quickly learned that the level of care and finishing that I put into my pipes makes them unsaleable in a retail shop. 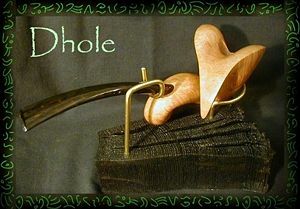 Often I'm lucky to break even on a $400 pipe for the labor involved, and I can only imagine the commercial reception to a "No Name" pipe maker charging $800 retail prices for his work! The other factor influencing my direct sales is that I simply don't make enough pipes to go around. I make perhaps 20 to 30 a year at best, most of which sell quickly, and I just don't have the stock or production to keep a retail shop provided. I still work full time with dad doing control design. I'm not doing any commercial art at the moment, though I do the occasional sketch for my own entertainment or for a gift. Pipe making takes up most of my spare time these days. I probably spend 15-20 hours per week, at best, making pipes, but I want to see how sales will do when I've had more than a year in the market. Pipe making produces a nice bonus income, but it's not something I want to depend on. I guess I've sold or given away about 20 pipes, counting the ones I made as Christmas presents, over the last couple of years. That's not too many, but then I'm not really interested in becoming a high-volume maker. I'd rather keep my output small and as polished and excellent as humanly possible. Even if I were full time, I doubt I'd make more than 70 pipes a year, given the time that goes into each one. Trevor indicated that he does both paining and illustration and has done both the gallery thing as well as working for editors. He started his illustration career in 1990 when he had his fist big exhibition of paintings at the Atlanta Fantasy Convention with work in the surrealist/fantasy/horror style. After the show, he was invite to display his work in a local gallery, where it sold well. He did a couple of small shows in 1990 and returned to the renamed Atlanta DragonCon (now one of the biggest SF conventions on the East Coast) in 1991 and won the Best New Artist award, as well as a handful of other awards over the next few years. From 1991 though 1996, Trever worked at commercial illustration and produced paintings for his own occasional gallery shows. 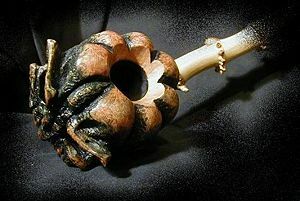 He originally intended pipe making to be a break from painting, which the first few pipes were. His illustration work slowly died, however, as he tried to raise his prices to something approaching profitability--an unfortunate effect of buyer value perception, as he puts it. Buyers were accustomed to his costing $X and balked at paying $Y, even though he feels that it was superior work. He basically reached the point where he wasn't willing to work cheaply anymore, a decision that affects his pipe-pricing philosophy as well. "Everyone has told me I'm supposed to sell cheap as an unknown pipe maker, but I already know all that will get me is a rep as $75 brand, which I'd never be able to shake, and I'd have to work so fast and crude that it wouldn't be worth doing at all." Feeling burned out over the money issue and finding that he was enjoying pipe making more than painting, Trever gradually dropped his commercial relationships. He has done no art for a couple of years except for himself (although lately he has been thinking about submitting some work to Pipes & Tobaccos) and to try and establish a whole new reputation. In fact, his dream is to someday support himself solely from pipe making and painting. Pipes also available at the The Pipe & Pint. domestic and imported beers. Ask for Larry! This page was last edited on 20 August 2016, at 17:18.